Vigil candles are typically short taper candles with thick paper or cardboard discs slipped about 1/3 of the way up from the candle’s base. Because vigil candles are generally carried by individuals during processionals or at candlelight ceremonies, masses or funerals, the candles do not have to be more than 6 inches long, but they must have a thick paper disc slipped over them to prevent hot wax from dripping on the holder’s hands or clothes during use. 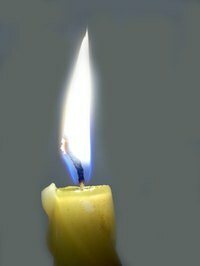 Widely used by churches, you can make your own vigil candles for a special event or memorial service and pass them out to attendees. Fill your double boiler with water. Set a dipping pot inside the double boiler and melt paraffin wax until smooth. Stick a thermometer in the wax and monitor it constantly to ensure that you maintain a constant temperature of 160 to 170 degrees Fahrenheit throughout the candle-making process. While the wax is melting (may take two hours or more), cut lengths of thick cotton string to use as wicks. Cut each length 3 inches longer than the desired candle length. For example, if you want to create a 6-inch candle, cut a 9-inch piece of string. Cut a number of lengths equal to the number of candles you want to make. Tie a small fishing weight to the end of each piece of string. Begin dipping the weighted strings into the melted paraffin, allowing the string to remain in the wax for three seconds on each dip. Allow one minute to pass in between dips. Try to maintain a fluid dipping motion, extending the string into the wax the same length each time. Making a mark in ink on the string may help you maintain a constant dipping length. After seven or eight dips, remove the weight unless you want it to remain in the finished candle. Continue dipping each string into the wax, but after eight dips, allow two minutes to pass in between dips. Continue dipping until you reach your desired thickness (around 16 dips should suffice). Lay the finished candle on a flat surface and roll it gently beneath your hand to flatten it slightly or straighten if necessary. Purchase an adequate amount of paper/plastic drip shields at your local craft store and bring them with you to the vigil or other event. Set them next to candles or slide them over the end of the candles for guests before they arrive. If you do not have a double boiler, place a small pot on top of a trivet and place both inside a larger pot. Fill both pots with water and ensure that the trivet raises the smaller pot at least 1/2-inch off the base of the larger pot. To color your taper candles, peel one crayon in the desired color per 1/4 cup of paraffin wax; add it to the wax as it melts.